# Preheat oven to 350 degrees F (175 degrees C). Butter a 9x13 inch baking dish. # Toss together cinnamon and nuts. Unroll phyllo and cut whole stack in half to fit the dish. 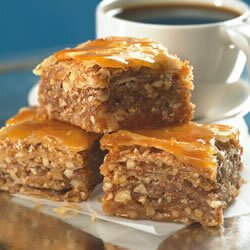 Cover phyllo with a damp cloth while assembling the baklava, to keep it from drying out. # Place two sheets of phyllo in the bottom of the prepared dish. Brush generously with butter. Sprinkle 2 to 3 tablespoons of the nut mixture on top. Repeat layers until all ingredients are used, ending with about 6 sheets of phyllo. Using a sharp knife, cut baklava (all the way through to the bottom of the dish) into four long rows, then (nine times) diagonally to make 36 diamond shapes.